1. Samsung scandal takes new turn: The de facto leader of Samsung — South Korea’s biggest conglomerate — has been arrested on corruption allegations. Lee Jae-yong has been under investigation as part of the huge political corruption scandal that has rocked the country. Prosecutors are accusing him of bribery, perjury, concealing criminal profits, embezzlement and hiding assets overseas. Shares in Samsung Electronics(SSNLF) — the crown jewel of the Samsung empire — dipped by as much as 2% Friday but closed the day with just a 0.4% loss. Shares hit an all-time high just a few weeks ago. 2. Trump visits Boeing: President Trump is heading to South Carolina on Friday to visit one of Boeing’s(BA) factories. This comes just months after he publicly attacked Boeing for the cost of its planned Air Force One. He’ll be making public remarks from the factory at 12:30 p.m. ET. Trump’s praise — or attacks — on listed companies have caused sharp moves in their share prices. 3. Stock markets sinking: U.S. stocks have spent the past week setting new record after new record. The stock market is having its best performance in the first month of a rookie president’s term since the 1960s. The push higher has been attributed to President Trump’s plans to boost business, cut taxes and deregulate various sectors of the economy. But investors are now pausing to catch their breath. 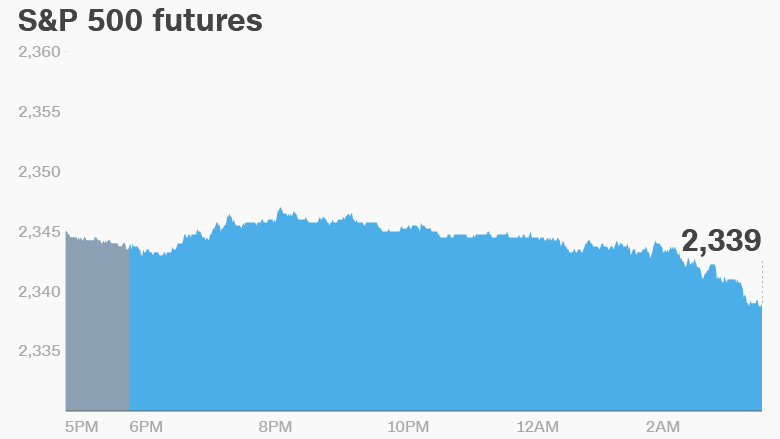 U.S. stock futures are declining a bit ahead of the opening bell. European markets are sinking in early trading. The majority of Asian markets are closing the week with small losses. 4. Another flurry of earnings: A busy week of earnings wraps up with quarterly numbers on Friday morning from Campbell Soup(CPB), Deere(DE) and Moody’s(MCO). 5. Wells Fargo tries to repair damage: Wells Fargo(WFC) will give investors a peek into its efforts to rebound from its fake account scandal when it releases monthly customer account numbers and holds a conference call on Friday. The bank has reported a dramatic decline in consumer checking account openings in recent months. It’s now looking to shut more than 400 branches.